#1 New York Times best-selling author of Medical Medium, Life-Changing Foods, Thyroid Healing, and Liver Rescue was born with the unique ability to converse with Spirit of Compassion who provides him with extraordinarily accurate health information that’s often far ahead of its time. Since age four, when he shocked his family by announcing that his symptom-free grandmother had lung cancer (which medical testing soon confirmed), Anthony has been using his gift to “read” people’s conditions and tell them how to recover their health. His unprecedented accuracy and success rate as the Medical Medium have earned him the trust and love of millions worldwide, among them movie stars, rock stars, billionaires, professional athletes, best-selling authors, and countless other people from all walks of life who couldn’t find a way to heal until he provided them with insights from Spirit. Anthony has also become an invaluable resource to doctors who need help solving their most difficult cases. Have you been told to avoid certain leafy greens, vegetables, fruits, or herbs like celery because they’re said to contain problematic oxalates? This is a common myth that’s preventing many people from getting the healing benefits these foods offer. Listen to this Medical Medium Radio Show to learn the truth about oxalates. The health of your liver is directly connected to your health and quality of life. You deserve to know which foods are truly healing and supportive so you can look after your hardworking and loyal liver. Listen to this Medical Medium Webinar to learn which foods are most supportive and healing for your liver. Chemical and food sensitivities are incredibly frustrating for the people who deal with them. What makes one person experience these sensitivities while another person can seem to be in any environment and eat anything they’d like? It all starts with your liver. Listen to this Medical Medium Radio Show to learn the truth. Oftentimes when people are called “emotional,” the implication is that the person is being too sensitive or even acting ridiculous. But there’s a physical root to many of the emotional responses people have. And it’s not your hormones. The truth lies in your liver. Listen to this Medical Medium Radio Show to learn more about how your liver is connected to your emotions. There’s a great deal of misinformation when it comes to the cause of weight gain. It’s not about your metabolism, how many carbs you’re eating, or even just about overeating. Listen to this Medical Medium Radio Show to learn another undiscovered underlying cause of mystery weight gain that you need to know about. We come into this world with compromised livers. A developing baby’s liver takes on poisons and pathogens passed down from prior generations of the family line. Medical communities are not yet aware of this truth. But there are answers for you here. Listen to this Medical Medium Radio Show to learn how to protect your children. True brain fog is not just a grogginess that can be shaken off. It’s a chronic condition that can be very disruptive in someone’s life. It’s It’s essential to understand the true root cause of brain fog so you can heal. Listen to this Medical Medium Radio Show to learn the undiscovered cause. Millions of people around the world suffer from gallbladder, weight, and/or gut health issues of all kinds. The pain and suffering can be tremendous - physically, emotionally and financially - as people chase after solutions that leave them drained and often even sicker than they started out. Listen to this webinar to learn the truth about gallbladder, weight and gut health issues and how you can finally start to heal. Despite its seemingly clear-cut name, there is still a large amount of mystery around fatty liver in medical communities. And today’s health and diet trends aren’t helping our livers’ health. Listen to this Medical Medium Radio Show to learn why you could have fatty liver, why it matters, and what you can do about it. If you deal with eczema, psoriasis, acne or other skin problems, you know how frustrating and debilitating these conditions can be and how difficult it can be to find solutions. Listen to this Medical Medium Webinar to learn the root cause of these skin conditions and how to finally start healing. Bloating is an experience so commonplace that you may not even think of it as a symptom of anything underlying—yet its very often a sign of a liver calling out for help. Listen to this Medical Medium Radio Show to learn how you can take care of your liver and reverse the bloating. Medical communities are unaware of how many symptoms, conditions, and diseases are rooted in an overloaded liver. They also don’t understand the best way to heal it. Listen to this Medical Medium Radio Show for critical insights into how to support and heal your liver with what it really needs. Many myths abound about the liver. Sometimes they’re fads that won’t accomplish what they say they will. Sometimes they’re more persistent beliefs that we need to be aware won’t help us. Either way, it’s important that you understand the truth so you don’t unknowingly hold yourself back. Listen to this Medical Medium Radio Show to learn the truth about the liver. Like weight gain, mystery hunger is a health issue that is often treated unkindly. Rest assured it’s not a character flaw or a moral failing. It’s not your fault. There’s a very real explanation for why mystery hunger can plague somebody. Tune in to this Medical Medium Radio Show to learn what’s really behind mystery hunger. The liver is one of our smartest, most underestimated organs. It has your back like nothing and no one else can. That’s never truer than when it’s enlisting its dedicated team of defenders — its own personal immune system — to protect you. Listen to this Medical Medium Radio Show to behold the sophistication of your liver. What the liver does to screen and filter is miraculous. It stands between us and tremendous suffering from the world’s toxins and pathogens. Listen to this Medical Medium Radio Show to understand why almost everyone has toxic blood and what you can do about it in order to heal. Chronic illness is at an all time high. We are exposed to so many toxins in this world that our liver works hard to manage. But at some point our liver becomes overburdened and this is what I call “sluggish liver.” Listen to this Medical Medium Radio Show to learn how to support your liver. If you or someone you love has a chronic illness or symptom, it’s important to understand the role of exercise in your recovery. Even if you’re unable to exercise, this information applies to you. Listen to this Medical Medium show to learn the truth and move forward in your healing. There’s an epidemic of women with breast implants who are sick or symptomatic. This is not only because of the implants themselves but also any underlying conditions a woman may have. Whether you are considering getting implants, have them now, or have had them removed, this information is critical. Listen to this Medical Medium Radio Show to learn how to begin to heal. As people start including healing foods and natural supplements in their diet, they often wonder how to know when they are truly cleansing and detoxing. Listen to this Medical Medium Radio Show to learn details about the signs and symptoms of detoxing. We can all suffer wounds to the soul when we encounter hardships in life. That leads to all kinds of soul-searching as people consciously or unconsciously look to feel whole again. Nature can provide powerful soul restoration. Listen to this Medical Medium Radio Show to learn how you can harness its soul-healing benefits. Alzheimer’s can be devastating for those who suffer with it and for their loved ones. Medical science still does not know the cause. Thankfully, there are answers and healing is possible. Listen to this Medical Medium Radio Show to finally learn the cause of Alzheimer’s. The 28-Day Healing Cleanse as outlined in the first book can move health mountains. It’s like a reset button for your body. Following these guidelines for four weeks has helped thousands reduce inflammation and reverse every illness there is. Listen to this Medical Medium Radio Show to learn how the 28-Day Cleanse can help you as well. There are so many myths about protein we’ve been conditioned to believe over many decades. These myths have led people to become sicker than ever before. Listen to this Medical Medium Radio Show to finally learn the truth about protein. Fasting is a popular tool in healing. There are many kinds - juice fasting, water fasting, dry fasting, and intermittent fasting. Some types of fasting are helpful and some are harmful. Listen to this Medical Medium Radio Show to learn more about safe types of fasting. There is so much misinformation out there about what’s good and bad for oral health care. It’s time to set the record straight so you and your loved ones can properly understand how teeth and gum problems occur and have the best possible oral health in the future. Listen to this Medical Medium Radio Show to learn more. Vitiligo is a mystery illness that is not understood by medical science and research. But, there are answers and you can heal. Listen to this Medical Medium Radio Show to learn the true cause and how to finally heal. Diagnoses of COPD are on the rise. Medical science admits all they can do is try to treat the symptoms. That’s hardly comforting for those struggling and looking for answers. Listen to this Medical Medium Radio Show to learn the true cause of COPD so you can finally heal. Millions struggle with both high and low blood pressure. Yet, medical science still has no idea what the true cause is. In fact, they generally aren’t even looking at the right organ behind this problem. Listen to this Medical Medium Radio Show to learn the truth about how to stabilize and manage blood pressure. Growing your own food can be the best thing you ever do for yourself. These foods will protect you with fierce devotion. And you don’t have to have access to property to be able to take advantage of this powerful tool. Listen this Medical Medium Radio Show to learn how growing your own food can help you heal. Discover the true causes of enlarged prostate and prostate cancer in this radio show. Medical communities do not yet know what’s really behind these common conditions and, as a result, men are not receiving the information they need to heal. Listen to this Medical Medium Radio Show to learn the truth. Polycystic Ovarian Syndrome (PCOS) is affecting more women today than ever before. Yet, the conventional medical advice offered often makes it worse. Listen to this Medical Medium Radio Show to learn what the true cause is and how to finally heal. Migraines can be debilitating for the millions who suffer. Medical communities don’t know what causes most types of migraines. Listen to this Medical Medium Radio Show to learn the truth about what causes migraines so you can end your suffering. Medical Medium Anthony William has been hearing Spirit of the Most High, the living word Compassion, since the age of 4. He has experienced first hand the healing power of compassion for others’ suffering, as well as our own. Listen to this Medical Medium Radio Show to learn how you can cultivate compassion to ignite healing. Asthma symptoms affect millions of people worldwide: coughing, wheezing, unable to take a deep breath, tightness in the chest. Alarming, panic causing symptoms. Yet experts still haven’t discovered the root causes. Listen to this Medical Medium Radio show to finally get the answers for the unknown causes of Asthma. Many women suffer from the pain and infertility of endometriosis. Yet, medical science doesn’t know what causes it, and for this reason people can receive misguided advice that can exacerbate the condition. Listen to this Medical Medium Radio Show to finally get the truth on how to heal. Wild berries hold ancient and sacred survival information from the heavens, going back tens of thousands of years. They have a powerful DNA and are loaded with antioxidants – the anti-aging substance that you want. Listen to this Medical Medium Radio Show to learn more information on the healing miracles of wild berries. There is much talk about the Lymphatic System, but there is still much to be discovered about how it really works and its role in your overall health. Listen to this Medical Medium Radio Show to learn groundbreaking information and tools for optimal lymphatic health. Suffering, wounds, pain, losses, sorrow, hardships, trials, letdowns and battles are not what any of us would choose. When they visit us though, we get our greatest treasures. Listen to this Medical Medium Radio Show to learn about why your hardships mean you’re a special person who can change the world. Understand the real causes of Crohn’s, Colitis, and Irritable Bowel Syndrome (IBS) that medical communities are yet to discover. Listen to this this Medical Medium Radio Show to learn how these different conditions develop and the steps that you can take to heal. Lectins are being blamed for a host of health problems today, and yet science doesn’t even fully understand how they work. It’s important you know the truth about lectins so that you can avoid hindering your healing or compromise your health with today’s trendy misinformation. Listen to this Medical Medium Radio Show to learn the truth about lectins. There is more to understand about Urinary Tract Infections (UTIs) than medical communities currently know. You can be free of the pain and discomfort caused by these infections once you understand what’s really behind them. Listen to this Medical Medium Radio Show so you can learn how you can finally heal. If you or someone you love have been diagnosed with an autoimmune disease, chances are you’ve been told that your body is attacking itself. Hearing this probably stripped you of hope that you can heal and left you feeling betrayed by your own body. Listen to this Medical Medium Webinar to learn the truth about autoimmune and how you or your loved one can finally start to heal. Do you suffer with burning, pain, and/or numbness in the face, jaw, or even eye? These are signs of trigeminal neuralgia, which is a condition that is not yet understood by medical communities. Listen to this Medical Medium Radio Show to learn more about what’s really behind this condition and how it can be healed. There is a dangerous trend today: fruit fear. We are eating less fruit than ever before in history and chronic illness is increasing at an alarming rate. There’s a direct connection. If you’re wary of eating fruit or think you have fructose intolerance or malabsorption, tune in to this Medical Medium Radio Show episode. Medical communities aren’t yet aware of the true cause of the skin condition called Lichen Sclerosus. Listen to this Medical Medium Radio Show to learn what is really behind this condition and steps to begin healing. It’s critical to understand the real cause of gallbladder problems, like gallstones, in order to recover your health and prevent future pain and sickness. Medical science and research only have a limited understanding of this organ and gallstones. Listen to this Medical Medium Radio Show to learn how you can heal. Fibroids are another symptom that is a mystery to medical science and research. But there are answers for you. Listen to this Medical Medium Radio Show to learn the true cause of fibroids and the steps needed for healing. Medical communities know that acid reflux (heartburn) is a result of stomach acids rising up into the esophagus, but they don’t yet understand what causes it to happen in the first place or what’s needed for true healing to occur. Listen to this Medical Medium Radio Show to learn how to truly heal acid reflux. Listen to this 90 minute webinar where Medical Medium Anthony William covers Hashimoto's, Hypothyroid, & Hyperthyroid in detail. Once you know the truth about what’s really behind your symptoms, a weight is lifted off your shoulders and relief comes because you finally have real answers and you and your loved ones can finally move forward and heal. Bipolar disorder is yet another mystery illness that medical communities don’t understand. People with bipolar are often greatly misunderstood and often battle their illness with minimal support. Listen to this Medical Medium Radio Show to learn what causes bipolar and how to support healing. Are you or anyone you know suffering with a condition like candida, small intestinal bacterial overgrowth (SIBO), leaky gut, poor digestion, constipation, diarrhea, Crohn's disease, colitis, inflammatory bowel disease (IBS), diverticulosis, abdominal pain, bloating, excess gas, or another gut condition? If so, you will want to listen to this Medical Medium webinar to understand what’s really behind gut conditions and what you can protect your health now and minimize or prevent sickness in the future. Have you had all or part of your thyroid removed or received radioactive iodine treatment? If so, you may be surprised to learn that you will still have thyroid tissue working for you and it’s important to support the health of this tissue. Listen to this Medical Medium Radio Show to learn more about how one can still heal even if their thyroid has been removed or radiated. Listen to this Medical Medium webinar to learn the undiscovered causes of cancer. It’s critical to understand what’s really happened in someone’s body to eventually lead them to receive a cancer diagnosis, and that’s exactly what Anthony William will uncover in this 90-min webinar. Certain foods have the power to recover the health of your thyroid, reduce nodules, tumors and cysts in the thyroid, stop the thyroid from shrinking, decrease inflammation, and more. Listen to this Medical Medium Webinar to learn about the essential foods for healing. Do you have Hashimoto’s Thyroiditis, Graves’ disease, thyroid cancer, hyper or hypo thyroidism, thyroid nodules, cysts, or tumors, or suffer with hair loss, weight gain, dry skin, moodiness, heart palpitations, or other symptoms? Listen to this Medical Medium Radio Show to learn how the thyroid really works and what’s behind these and many other symptoms. Insomnia is a debilitating condition that plagues many people. And yet, no matter how many sleep studies are done, medical communities are no closer to understanding the real causes of insomnia and the metaphysical laws of sleep. Listen to this Medical Medium Radio Show to learn secrets for healing insomina. Termed an autoimmune disease, medical science and research currently have no answers for people suffering with Postural Orthostatic Tachycardia Syndrome (POTS). But there is a very real and specific cause and healing can happen. Listen to this Medical Medium Radio Show to learn the cause of POTS and how to start healing. Do you suffer with Rheumatoid or Psoriatic Arthritis? These conditions are incorrectly labelled as autoimmune diseases, but this couldn’t be further from the truth. Sadly, medical communities are not able to help people with these conditions because they don’t know their true cause. Listen to this Medical Medium Radio Show to learn the the truth about Rheumatoid & Psoriatic Arthritis and how to start to heal. Have you ever felt confused about the conflicting information on which foods and supplements are best during pregnancy? Listen to this Medical Medium radio Show to learn the truth about how to nourish yourself and your growing baby. There is a tremendous amount of misinformation surrounding Tourette's, which often leads to those who suffer with this condition being greatly misunderstood. Listen to this Medical Medium Radio Show to learn about the unknown cause of Tourette's and helpful healing steps one can take. Anxiety and depression are two of the most prevalent mystery illnesses plaguing our world. Both anxiety and depression can be healed when you know what’s really behind these conditions and the specific steps required for healing. Listen to this Medical Medium Radio Show to learn the truth behind anxiety and depression. If you or someone you love is suffering from an eating disorder, you’ll know how crippling they can be. And yet medical communities have almost no understanding of these conditions. Eating disorders include far more than just anorexia and bulimia and are shockingly common. Listen to this Medical Medium Radio Show to learn about the true cause of eating disorders and how to heal. Bell’s Palsy is not yet understood by medical science and research. While Bell’s Palsy usually passes, the root cause needs to be understood and addressed to help recover from and prevent other symptoms and illnesses. Listen to this Medical Medium Radio Show to learn what’s really behind this condition. Medical communities aren’t yet aware of the true cause of kidney disease and other kidney problems. Listen to this Medical Medium Radio Show to learn what is really behind various kidney issues and the steps to begin healing. Pregnancy is a time when it’s essential to look after your health – for your sake and the baby’s. But most of the healthcare information available today for pregnant women is misguided and unproductive. Listen to this Medical Medium Radio Show to learn the truth so you can be prepared during this sacred time. Lupus is a mystery illness that medical communities mistakenly believe is an autoimmune condition. The truth is that lupus is not the body attacking itself. There is an invader in the body causing symptoms. Listen this Medical Medium Radio Show to learn more about Lupus and this groundbreaking healing information. Medical science and research are unaware of the true cause of Parkinson’s disease and its currently believed that there’s no cure. In truth, Parkinson’s can be healed when you know the real cause and the steps to heal. Listen to this Medical Medium radio Show to learn the truth about Parkinson’s. Restless legs syndrome can be terribly painful and frustrating but for many sufferers there is no lasting relief. This is because medical communities are unaware of the true cause and healing steps for this problem. Listen to this Medical Medium Radio Show to learn what’s really behind this condition and how you can heal. Inflammation is a commonly used “catch all” term given to explain hundreds of different symptoms and conditions. But what’s being missed is the root causes of the inflammation people are experiencing. Listen to this Medical Medium Radio Show to learn the two reasons why inflammation occurs and how to address it. Medical communities suggest a number of reasons for the development of small intestinal bacterial overgrowth (SIBO), but the true explanation is still universally unknown. Listen to this recent Medical Medium Radio Show to learn about the true cause of this disease and how you can begin to move past it. Do you struggle with dry skin, thinning hair or brittle nails? Poor skin, nail, and hair health is an external indication of internal issues. Listen to this Medical Medium Radio Show to learn how you can address any underlying causes that maybe keeping you from strong nails, glowing skin, and healthy hair. Obsessive Compulsive Disorder (OCD) is considered by medical communities to be an incurable anxiety or behavioral disorder. What medical science and research doesn't yet know is that OCD has a tangible physical cause and healing is possible. Listen to this Medical Medium Radio Show to learn the truth about OCD in this episode. ALS is a complete mystery to medical science and research. It is often misdiagnosed with serious consequences to the people involved. It’s critical to understand what is really causing the symptoms associated with ALS and how they can be addressed. Listen to this Medical Medium Radio Show to learn more. There are many environmental factors that contribute to illnesses and symptoms. It’s vitally important to understand how you and your loved ones can protect and strengthen yourselves against them or minimize exposure in the first place. Listen to this Medical Medium Radio Show to learn about the triggers of environmental illness. Food poisoning can cause more damage than just the horrible symptoms someone usually experiences right after exposure. It can also cause long-term symptoms and conditions that medical communities are unaware of. Listen to this Medical Medium Radio Show to learn how to help prevent food poisoning and to understand how it can affect your body. Chronic dehydration is a pervasive problem, even for people who may not feel thirsty. It can contribute to an endless amount of symptoms including migraines, poor concentration, brain fog, fatigue, constipation, and more, and can also be a symptom of other underlying health issues. Listen to this Medical Medium Radio Show to learn if you are chronically dehydrated and how to finally heal. Colds & flus are more rampant and severe today than ever before, oftentimes leaving people sick and unable to function many times a year. It’s essential for everyone to know how to protect themselves against the many bugs we are exposed to today. Listen to this Medical Medium Radio Show to learn some surprising truths in this episode. While there is some understanding of herpes today, there is much more to know for true healing to occur. Listen to this Medical Medium Radio Show to learn about the different varieties of herpes such as Cytomegalovirus, Simplex 1, Simplex 2, Epstein Barr Virus, Shingles, HHV-6, & HHV-7 and learn practical tips for how to begin healing. Addictions can control and ruin our lives and the lives of our loved ones. With more people experiencing addiction than ever before, it’s never been more important to understand its many contributing factors. Listen to this recent Medical Medium Radio Show for this second episode to learn how to better understand addiction and steps to help you move forward. Addictions can control and ruin our lives and the lives of our loved ones. With more people experiencing addiction than ever before, it’s never been more important to understand its many contributing factors. Listen to to this recent Medical Medium Radio Show to learn how to better understand addiction and steps to help you move forward. The current misconceptions about methylation and genetic mutation by medical research and science are leaving many people hopeless and lost. The information simply isn’t correct and it’s leading people down a path that prevents healing. Listen to this recent Medical Medium Radio Show to understand the truth. Seasonal Affective Disorder (SAD) is said to be a condition where someone’s health is affected by the seasons. In reality, there’s much more behind this condition than medical communities know. Listen to this recent Medical Medium Radio Show to learn how to understand the true causes of SAD and how to begin healing. It's virtually impossible not to take in a certain amount of toxic heavy metals in our modern era. They contribute to illnesses like Alzheimer’s, ADHD, depression, Autism, and more, so it's vitally important to our health and our children that we know how to safely remove them. Every parent wants their children to be healthy, but it can be hard to know what's best when at every turn there's conflicting information. Listen to this Medical Medium Radio Show to learn the best ways to help your children stay strong and healthy through childhood. With heart disease, heart attacks, and other heart conditions like pericarditis, arrhythmia, heart palpitations, and more on the rise, it’s never been more essential to understand the true cause of common heart conditions. Listen to this Medical Medium Radio Show to learn the truth about heart health. With the epidemic of chronic illness and the stressful pace of modern life, it’s never been more important to protect our health. One of the secrets to surviving and thriving is to eat more wild foods. Listen to this recent Medical Medium Radio Show to learn more about their incredible healing properties. Over 80% of us will experience adrenal fatigue throughout our life. With symptoms like crashing in the afternoon, yet feeling wide awake at bedtime, or exhausted after sleep, adrenal fatigue is very real. However, all too often it’s confused with neurological fatigue from another cause. Listen to this recent Medical Medium Radio Show to learn the truth about adrenal fatigue and how to finally heal. There are many angels fighting for us, ready to provide guidance and assistance. The Life-Changing Angels are one of the hardest working groups of Angels and are responsible for all aspects of food supply. Listen to this Medical Medium Radio Show to learn about these incredible Angels and how to connect with them. Do you fear eating fruit because you think its sugar content is detrimental? This is a common trend that is holding people back from healing. It’s time to know the truth about fruits like mangos, bananas, papayas, and more! Learn their phenomenal physical, emotional, and spiritual benefits in this Medical Medium Radio Show episode. The foods we choose to eat directly impact our health and ability to heal from any chronic illness. We have a limited number of meals in this lifetime, so it’s critical to know what to choose to support healing. Discover the best foods for chronic illness in this episode. Everyone alive today is unknowingly being exposed to the detrimental effects of The Unforgiving Four in some way. These four factors are the missing piece we must all understand for true healing of symptoms and illnesses. This is one of the most important Medical Medium Radio Show episodes yet. Have you ever felt beaten down, defeated, or crushed by chronic illness or pain? Or from an emotional hardship like the loss, betrayal, or illness of a loved one? It is possible to heal and you can reclaim your health and happiness. Listen to this recent Medical Medium Radio Show to learn how. Herbs and spices don’t just add flavor to our meals. They also have healing powers that can help to transform your health. Listen to this Medical Medium Radio Show to learn unknown healing properties of some of the most powerful herbs and spices. With symptoms ranging from a runny nose and itchy eyes to migraines, fatigue, and more, allergies can make life miserable. Thankfully, there are many natural methods we can empty to heal the root causes of allergies and prevent future reactions. Listen to this recent Medical Medium Radio Show to learn about healing allergies naturally. Alzheimer’s, memory loss, MS, Parkinson’s, brain fog, and more. These are very real conditions that are ruining the lives of many. Listen to this Medical Medium Radio Show to learn the truth behind these illnesses and how you can begin to heal and restore the brain. Grains have been both celebrated and shunned in the health world in recent years, so what’s correct? There’s more that needs to be brought to light. Listen to this Medical Medium Radio Show to learn the real truth about grains. We all know vegetables are important for health, but did you know they have hidden healing powers that can help not only your physical health, but your emotional and spiritual health too? Listen to this recent Medical Medium Radio Show to learn about some of the phenomenal benefits of humble vegetables. If you suffer with gut issues, you’ll know how frustrating, painful, and even debilitating it can be. Gas, bloating, constipation, loose stools, poor absorption, and tummy pains are signs that your gut needs attention. Listen to this recent Medical Medium Radio Show to learn the true causes and how to address them. Millions of people deal with mysterious weight gain, hair loss, fatigue, brain fog, hot flashes, dry skin, restless legs, insomnia, impaired memory, depression, menopause symptoms, anxiety, dizziness, and more. Sound familiar? If so, you may have a thyroid condition. Listen to this recent Medical Medium Radio Show to learn the truth about thyroid disorders and how to finally heal. While eye health problems like blurriness, stys, cataracts, glaucoma, falters, optic nerve issues, burning, dryness, and more, are extremely common, their true causes are still largely unknown. Until these conditions are properly understood, healing will be limited. Join Anthony William as he reveals the truth behind common eye health issues. Recovering From Physical Injuries", could you please upload to SoundCloud? here is the copy: If you’ve ever suffered with a physical injury, you’ll know how painful, inconvenient, and reoccurring they can be. Fortunately, there’s more that can be done to reduce inflammation and assist recovery from injuries. Listen to this recent Medical Medium Radio episode to learn more. The real causes of chronic skin conditions are still largely unknown in medical communities, so millions of people are suffering with no clear answers. In this episode, Medical Medium Anthony William reveals what's really behind skin conditions like acne, eczema and psoriasis, and how you can begin to heal. If you suffer with a sensitive central nervous system, neuropathy, tingling, humming, buzzing, tremors, shakes, chemical sensitivities, fatigue or brain fog, your neurological system needs some help. Learn about the true causes of neurological symptoms and how to begin healing in this very important episode with Medical Medium Anthony William. In today’s world, root canals, fillings, tooth pain, and gum disease are commonplace, but there’s much more to learn about these conditions than is currently understood. Proper oral health care is critical, and this episode will reveal Medical Medium Anthony William’s top tips for a healthy mouth. Your immune system is your defense against viruses, bacteria, and toxins, so doing everything you can to keep your immune system strong is essential for illness recovery and prevention. Fortunately there are many easy, natural ways to do this. Find out Medical Medium Anthony William’s top recommendations in this important show. Shingles is largely misunderstood in medical communities today. There are many varieties of this virus ravaging people’s health that are not even known by medical research. It doesn’t only cause the typical rash and nerve pain, but also migraines, neuropathy, and much more. Learn all about shingles in this important show. Meet Epstein-Barr virus, one of the biggest mystery illnesses causing millions of people to suffer today. EBV is secretly behind debilitating conditions such as fibromyalgia, chronic fatigue syndrome, multiple sclerosis, rheumatoid arthritis, thyroid disorders, and much more. Join me as I reveal the truth about EBV in this episode. It's common knowledge that mold exposure can make us sick, but there's more to it than just avoiding moldy areas. Mold is often just the trigger that worsens other already existing conditions. Learn all about mold, how it impacts health, and how to heal from mold exposure in this episode. Your liver is responsible for flushing toxins out of your body, but with the amount of toxins, viruses and bacteria we are exposed to, along with unhealthy diets and lifestyles, our livers are overburdened. Getting your liver back to optimal functioning is critical for good health. Learn how in this episode. Most people know to avoid fried food, preservatives and artificial flavors, but there are other problematic ingredients hidden in our food today that are critical to avoid if you wish to heal. These ingredients can feed viruses, bacteria, and fungus, and inflame the body. Learn more in this important episode. In medical communities, depression is still a condition with great mystery behind it. Because it’s not well understood, recovery is also compromised. 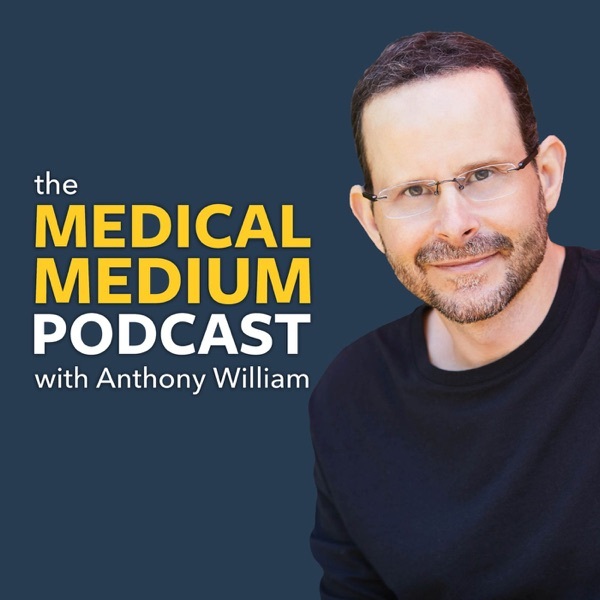 In this episode, Medical Medium Anthony William reveals the key triggers of depression and how you can begin to break free of its imprisonment. You were born with the God-given right to reach out to angels whenever you need them. Angels want to help ease our minds, rebuild our spirits and souls, and heal our bodies, but it's essential to know how to reach them. Medical Medium Anthony William shares how you can receive their help.